the smoke detector becomes less sensitive and may not operate correctly in the event of the presence of smoke. Most modern addressable fire detection and alarm systems have the capacity to record the level of contamination of a smoke detector over time. When an individual detector exceeds a predetermined threshold it can signal a warning (not an alarm) that it is becoming contaminated and needs attention. Every fire detection & alarm system operates differently however this principle is typical for most systems. The most common type of contamination is caused by atmospheric particulates being circulated by the heating and air-conditioning systems in buildings. Other causes include building works including, carpentry, sanding, painting, and the like. If you have ever left a level surface in a building for more than a week, you will see these particulates accumulate, and smoke detectors are no exception. While many fire detection & alarm systems can identify a contaminated smoke detector not all of them provide a readily visible or audible warning. In addition, there is currently (2012) no Standard requiring contaminated smoke detectors be reported. The most common early indication that there may be a problem is two or more nuisance alarms from the same detector or area within a building. All fire detectors have a finite operational life, and this varies for every type, make, model and installation conditions. In addition, technology changes and some fire detectors become obsolete or difficult to replace cost effectively. 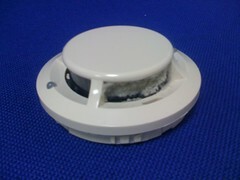 replace the existing smoke detector with a compatible refurbished (cleaned) unit. Firewize can offer customers both options depending on the specific site specific requirements. Firewize can help reduce the incidence of nuisance alarms from contaminated smoke detectors by identifying dirty detectors early, and implementing a program of replacement. For more information, please contact your Firewize Account Representative or telephone our support team on 1300 30 88 02.